Stones Throw is releasing a new video compilation DVD on Feb. 12 with all the new “innovative” videos and tons of great extras. For the label’s follow up, the West Coast mavericks have assembled a more advanced curriculum, In Living The True Gods – a line borrowed from Madvillain’s “Accordion,” seen for the first time on this collection. From the surrealist Quasimoto “Bullyshit” animated video to the late J Dilla’s last appearance on film in MED’s “Push” to the neo-noir animated nightmare of Madvillain’s “Monkey Suite,” this anthology demonstrates Stones Throw’s widening, and never retiring, creative base. A series of bonus features range from an exclusive J Dilla interview from 2003 to a mini-documentary Charizma and Peanut Butter Wolf, shot in session on VHS in 1992. 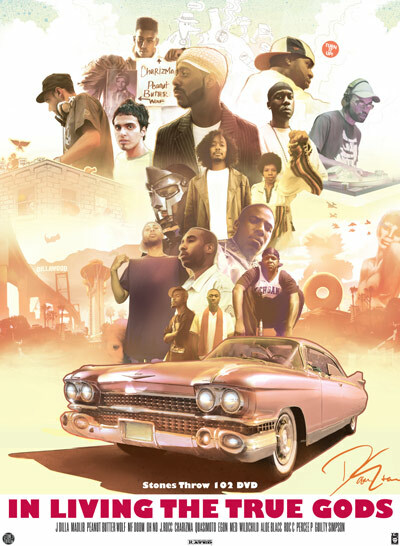 • J Dilla, 2003 interview in The Netherlands – previously unseen in its full length form. • Charizma and Peanut Butter Wolf “Studio Time 92” – a newly assembled mini-doc of the group, with VHS footage circa 1992.